Explore one of the oldest French cities with freedom and comfort – book a vehicle in car rental Narbonne! Now the cheapest cars are easy to get – just fill in the search form! Independence is more than affordable now – complete our form and see the shocking low car rental prices we offer! Car rental Narbonne is your simple and cheap solution of any transportation task. Business or leisure – no matter, you’ll get the best car rental deal in the market and high-quality service. Enjoy any distance with car rental Narbonne! After you’ve booked a vehicle using our form choose a convenient Narbonne car rental location and check Must Know and Places to Visit with car rental Narbonne! Narbonne is an ancient city in the province of Languedoc with a small population of about 46 thousand people. 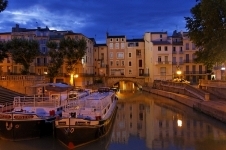 Narbonne was founded in 118 BC by Gallic and Roman colonies and served as an important seaport. It was the capital of Southern Gaul. Despite the fact that during the period of Roman rule Narbonne has reached its peak, today you won’t find there many reminders preserved from that era. Attractions of Narbonne are amazing in their antiquity. Caring citizens preserve the historic sites very well. 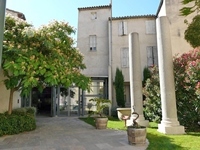 Don’t miss your chance to see everything Narbonne has kept for you to – explore the city in comfort with car rental Narbonne and have an exciting time! In France the movement is right-handed. Speed ​​limits: in the city - 50 km/h, out of the city - 90 km/h, on the highway - 130 km/h. 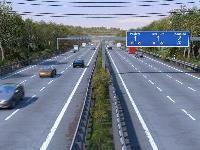 It’s illegal to overtake on an inside lane unless traffic is being channeled in a different direction. Petrol stations generally work 24/7. Note that the fuel is more expensive on the highways than in the city. Average price is 1.4 euros / liter. 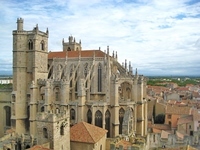 Drive your car rental vehicle 700 meters south-west of the Narbonne Cathedral and you’ll reach the Basilica. Basilica of St Paul was built by local craftsman and is a one of the first examples of the Gothic style in the south of France. The church has repeatedly destroyed and altered. The facade of the church responds to the local traditions. The apse is decorated with a colonnade of Romanesque style. In the interior of the cathedral Gothic elements are combined with Romanesque details. You must see it yourself! Driving your car rental vehicle 200 m north of the Cathedral you’ll see this spot. It represents a subterranean vaulted gallery ofthe1 century which in ancient times could serve as a warehouse. There are opinions that it could be a market on the ancient square, which then disappeared under the cultural layer. You can visit two of the three existing original galleries, north and west. They intersect with each other. Drive your car rental vehicle right to the center of Narbonne, there is one of the main attractions of the city – the Cathedral. The Cathedral was built on a grand scale: the length of the choir - 60 m, width - 40 m. This cathedral is one of the tallest churches in France, along with the cathedral in Beauvais and Amiens. 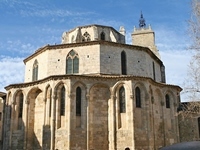 It is characterized by well-balanced volumes, making it an outstanding architectural monument of the early 14th century. The cathedral has a remarkable organ. It dates back to the 18th century, and was made by a master Christoph Musherelem. The organ has four manuals and plays 67 tunes. RentalCars24h.com offers you reliable car rental Narbonne services that will help you to feel free and independent when moving around the town. Providing best online prices for car hire Narbonne services, RentalCars24h.com allows you to save money each time when you rent a car in Narbonne.